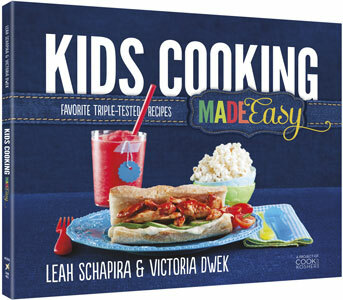 Now it’s our children’s turn to enjoy Leah Schapira and Victoria Dwek’s “Made Easy” cookbook series, with Kids Cooking Made Easy. Here’s what these great cooks told us about this new, fabulously fun cookbook. ArtScroll: Why kids? What’s so great about children in the kitchen? Leah: Kids are always looking for something fun to do. They love to eat, and they get bored fast. For kids and parents, this book is Win-Win. Victoria: Kids are always in the kitchen. They can either be having races, playing a game in the middle of the floor, shooting rubber bands at each other…or cooking. This lets them be productive. Teaching kids to cook is also the cure to picky eater syndrome. When kids make things themselves, they get so excited and feel so confident, and naturally become open to trying new things. And they’ll be eating healthier too. Artscroll: You “triple-test” all your recipes, which is what makes them so foolproof. How did triple-testing work with younger food samplers? Leah: We gave the kids the complete recipe and watched what they did without saying a word. Every so often if I saw them stuck during one of the steps, I took out my pen and added in a line to clarify the instructions. For example, when my daughter was making Penne Rose, I realized that if she pours the tomato sauce all in at once, it will splatter. So we added, “Slowly…pour in the sauce.” The details matter when kids are cooking. Victoria: Since these are the recipes our kids love, they are way more than triple-tested. They are the real family-friendly dishes we’d be cooking even if there was no cookbook. Artscroll: What do the kids love best? Leah: They went a bit crazy for our Edible Sand Art, Hot Banana Peppers, Gummy Bear Rugelach and Honey BBQ Chicken Nuggets. Victoria: Personally, I dream about Rice Krispies Ice Cream Sandwiches all day. My kids also adore Taco Night, Cauliflower Poppers, Candy Bar Cookies, and Pancake Sandwiches. Artscroll: What’s the difference between developing recipes for children and adults? Leah: For safety reasons we don’t include some things, like frying. We also were able to have a lot more fun and develop recipes like Spray Candy – kids’ favorite junk food (that’s a lot less junky when it’s homemade). Victoria: Developing recipes for kids lets us go back to the basics and enjoy the simple comforting foods we all love.